Mickey, the Famous Mouse, is knitted with any easy care, non- animal fiber worsted weight red and black yarn that makes up to 16 stitches x 20 row to equal 4 inches. It’s sized to fit four sizes of babies from micro preemie, up to 2.5 lbs thru Newborns. 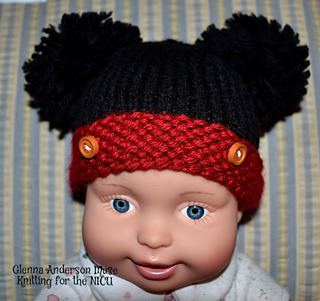 It’s a perfect pattern for charity knitters who create cute hats for NICU’s, Pediatric Units, and Newborns in Need or as a gift to any newborn baby.